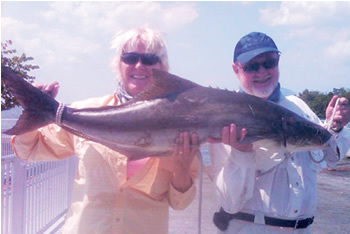 COBIA- One of the most sought after game ¬fish in Florida’s waters, cobia are hard ¬fighting and great table fare. Cobia season is open year round. You can harvest 1 cobia per day per person, no more than 6 per boat per day and keepers must measure 33 inches or bigger from the tip of the bottom lip to the fork of the tail down the lateral line of the ¬fish. In the winter months you can ¬find them under stingrays, manatees, and sea turtles. It’s not uncommon to ¬find multiple cobia together, but most of the time we see one or two at a time. Normally a male and female are together. The male is smaller with a stubby head and the female is larger with a big head. The male normally beats the female to your bait, so it’s important to pick out the female and present your bait to her like a quarterback leads a receiver on a pass. The top baits for these brown clowns are live free lined shrimp, whole or cut dead or live blue crab, or a black 10 inch plastic eel. We use 30lb test Power Pro braid with a 40lb test 4 . mono leader and a #4 Mustad straight short shank “J” hook. We’ve caught over 100 cobia this season and our biggest was just over 90lbs. In our opinion, during winter and summer, Tampa Bay is the cobia capital of the world. SHARKS- Several marine biologists claim that Tampa Bay is the shark capital of the world. They say we have the biggest population of sharks in the world and also the biggest variety of sharks in the world. Every year we work closely with Dr. Bob Hueter and marine biologist Jack Morris of Mote Marine Center for Shark Research. During our Black Tip Shark Shootout hosted by Hall of Fame legend Wade Boggs, we not only raise money for the Pediatric Cancer Foundation, we also work with Mote Marine on their shark tagging program. Our tournament anglers attend a shark identi¬fication course and are trained on how to properly tag and record all sharks caught that measure 4 and bigger. If you’d like to get involved with our shark tournament and take a bite out of Pediatric Cancer visit www.blacktipsharkshootout.com. Sharks stay with the rays in winter. e sharks we target the most are black tips, bonnet heads, and bull sharks. We use a wire leader with a #4 hook baited with either a chunk of lady ¬fish, mullet, silver trout, or XXL shrimp free lined during slack tide and weighted with a heavy current. Shark has a year round season with a limit of 2 sharks per day, per boat, and must measure over 15 inches. Black tips and bonnet heads are the best table fare. POMPANO & PERMIT- When you see rays in 4 and deeper water during winter time in the bay, you can bet you’ll ¬find a pompano or permit in the area. Our favorite bait to use is a pink Silly Willy jig with a sparkle feathered trailer hook. Work your jig at medium speed and DON’T be consistent with your retrieve, jig, jig, reel, reel, reel twitch, twitch, twitch, jig, reel, etc. Pompano season is year round and you can harvest up to 6 per day and must measure 11 inches to the fork. Permit are open August 1st to April 30th and must measure 22 inches to the fork with only 1 permit per person per day and no more than 2 per boat per day. Pompano and permit are some of the ¬ nest table fare available and pound for pound great ¬fighting ¬fish.